cryptocurrency mining Monero, Xmr, Neucoin, Bitcoin, Litecoin, Dogecoin, Mooncoin or any other Altcoin. 1.NEW Version Powered Riser Card SATA 15 PIN + BIG 4PIN Power Supply Input. 2. Slot is equipped with a fixed buckle so the card will not fall off from the slot. 4.No drivers needed to install. 5.The perfect solution for setting up Ethereum mining rigs, whether small open air rigs or large rack based miners. 6.Holes For attaching the riser card to your rig. 7.Board size: 13cm x 4.3cm x 1.2cm. 8.Gold plated contacts for flawless connectivity and a long lifespan. 1.When plug wire must identify the direction, not to counter or offset, prevent burning equipment, plug wire when the socket of equipment first, then plug wire, avoid too hard plug socket pin is broken. 2.Big 6 pin for power supply standard parts, please check put in place, when inserted into the power supply plug line must be careful. 3.If this pcie riser adapter is bought for mining riser, which will be used to 24 hours uninterrupted working, We recommend replacing your pcie riser adapter every 2 months for optimal performance. Compatibility：The adapter PCI-E card can be inserted in any PCI-E Slot: 1x, 4x, 8x, or 16x.New version riser kits are the perfect solution for setting up Ethereum mining rigs (or any other GPU-mined altcoin), whether small open air rigs or large rack based miners,Ethereum mining rigs or any other altcoin mining rigs. Quality:4 High Quality Solid Capacitors, Voltage Regulation, and overcurrent Protection,so that the graphics card more stable and safe power supply.We have high performance fuses and the prevent power reverse setting. Safe and reliable:Includes SATA 15pin Male to MOLEX 4pin power cable for more flexibility connecting to your power supply. reduces the power burden on your motherboard and ensures maximum compatibility with your power supply. Convenience:PCI-E connector with multi-layer shielded wire, the longest can be connected to 0.6M and will not attenuate the signal.PCI-E connector plug all gold-plated, more wear and increase the conductivity. Transfer card enhance power supply, so that the graphics card from the motherboard independent of the board, so as to reduce the burden on the motherboard to accept the graphics card. 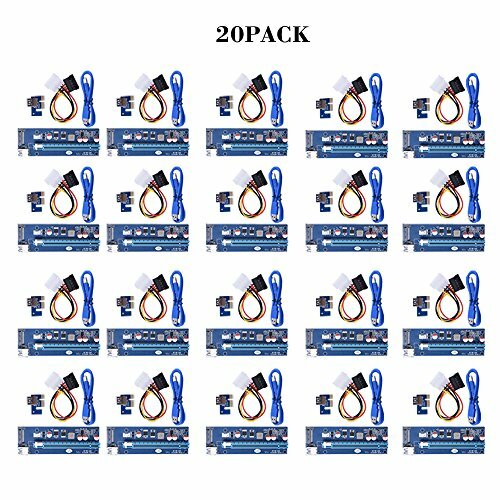 What You Get:20x PCI-E 16X riser board+20x PCI-E 1X adapter card+20x 60cm USB 3.0 blue cable+20x 15-pin SATA power cable + Sipolar fan-favorite 12-month warranty and friendly customer service.